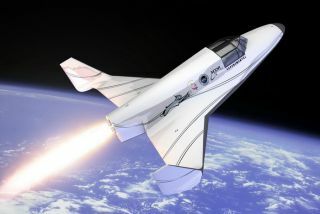 XCOR Aerospace's Lynx space plane is seen here in a rendering. The plane could begin flying passengers as early as later this year. The private spaceflight company XCOR Aerospace is getting a new CEO. Representatives with XCOR Aerospace — the company responsible for developing the Lynx space plane — announced today (March 16) that John "Jay" Gibson will lead the commercial spaceflight company. The former CEO, Jeff Greason, will remain with the company as chief technology officer and focus on helping to develop Lynx and other projects, according to XCOR. The Lynx space plane is designed to carry a pilot and a passenger on a journey to suborbital space and back. The plane could also carry scientific experiments to make use of the flight conditions, including the weightlessness achieved during the 30-minute-flight. XCOR's first Lynx (called Lynx Mark I) could begin test flights as early as this year. The company is planning to build two more types of Lynx space planes, Mark II and Mark III, as well. The Mark II models are designed to make suborbital flights of up to 60 miles (100 kilometers), up to four times a day, and Mark III should have the ability to launch microsatellites to space, according to XCOR. Seats to fly on Mark I are currently selling for $95,000, while Mark II seats are on sale for $100,000. "This year is vital to XCOR's plans," added Greason, who will continue to serve as chairman of the board and will remain a lead voice in space policy and industry circles. "With the commencement of the Lynx flight test program on the horizon, Jay's arrival allows this team to focus on getting Lynx in the air, moving forward on plans for our orbital vehicle, and transitioning XCOR to a more efficient and effective company." Gibson was previously the assistant secretary of the U.S. Air Force, and most recently, he was senior vice president of global mission support at Beechcraft Corp. in Kansas, XCOR said in a statement. "I am excited to join this exceptional team at a critical time on the XCOR journey to making space accessible to everyone," Gibson said in the statement. "The potential of commercially reusable rockets and vehicles in both the payload and passenger markets are incredible and are still being defined. This is a rare opportunity to participate in the continuing development of the space industry, and more specifically the success of XCOR, which stands at the forefront of the commercial spaceflight market." There are other companies hoping for a piece of the suborbital spaceflight market. British billionaire Sir Richard Branson's Virgin Galactic is also developing a space plane, called SpaceShipTwo, which could fly space tourists to suborbital space sometime in the future. Seats on SpaceShipTwo are selling for $250,000. Virgin Galactic recently suffered a tragic spaceflight accident when the company's prototype SpaceShipTwo broke apart in the air, leaving one pilot dead and another seriously injured.